Since the advent of nuclear medicine and molecular imaging in the 1950s,GE Healthcare has been at the forefront of innovation in diagnostic, therapeutic and research tools for healthcare professionals. Nuclear medicine allows us to assess organ function as well as structure, marking a new dawn in understanding disease at complex levels without the use of invasive procedures. The company's growing portfolio of products can detect pathological changes even at a molecular level. GE Healthcare nuclear medicine products include key diagnostic and therapeutic tools that are currently available in the fields of oncology, neurology and cardiology, as well as products for the rest of the body. GE Healthcare is dedicated to constantly adapting and innovating the best technology and equipment, and is always looking to the future by building on its current portfolio of products. We pride ourselves in working with healthcare professionals in order to understand all diseases, and are particularly committed to the recognition of early diseases. We are committed to continuing development and research of our current products as well as looking for novel compounds that can contribute to the revolutionary field of nuclear medicine. Capintec is a leading worldwide supplier of energy measurement products and services. Capintec is dedicated to continuous quality improvement that leads to uncompromising quality in the development of the most advanced technology and services in the industry. For over 50 years, Capintec has been recognized as a world leader in the development, manufacturing and marketing of state-of-the-art radiation measuring and monitoring instrumentation. With thousands of instruments in use world-wide, the company continually provides new and innovative solutions to radiation measuring applications. By offering products with applications in Nuclear Medicine, Nuclear Cardiology, Oncology, Endocrinology, Diagnostic Radiology, and Radiation Therapy, the company continues to grow. Pharmalucence, a Sun Pharma Company, is a New England based, manufacturer of human injectable pharmaceuticals. Our team of greater than 120 professionals performs manufacturing services of non-cytotoxic human injectables in either liquid or lyophilized form. Our new 70,000 sq. ft. facility is the region's first to utilize fully automated and isolated aseptic technology in support of a wide array of needs, from small clinical fills up to full commercial scale production for markets worldwide. This new facility, combined with our twenty plus years of experience and expertise, will provide our customers with compliance beyond currently mandated requirements. ITM IsotopenTechnologienMünchen AG was founded in 2004 and is a privately held group of radiopharmaceutical companies, dedicated to the development and proprietary production of novel radiopharmaceuticals and radio medical devices. Today, more than 50 highly trained employees bring in their profound knowledge and experience of meanwhile more than a decade, focusing on next generation radioisotope sourcing and processing for the treatment of numerous serious oncological diseases. World's largest manufacturer of radiation protective garments and vinyls. Since 1930, Bar-Ray Products has been the leading manufacturer of x-ray aprons and innovative personal radiation protection products. We offer a large variety of protective products to suit most diagnostic and imaging applications from healthcare to airport screening. Bar-Ray products are fully tested and warranted for one year to assure quality, safety and satisfaction. In partnership with our customers in nuclear power plants, military and civil defense agencies, hospitals, universities, national labs, and other specialized industries, Mirion Technologies strives to deliver cutting edge products and services that constantly evolve based on the changing needs of our customers. 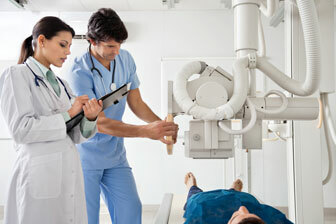 Vision RT develops market leading technology for Surface Guided Radiation Therapy (SGRT). By tracking the patient's 3D surface in real time, our technology enhances patient comfort and safety and improves the efficiency of radiation therapy clinics. Widely used on all treatment sites, it particularly benefits left breast cancer treatment by avoiding cardiac damage, and aids comfort and speed during brain treatments. AlignRT is a system which tracks a patient's position before and during radiation therapy, to aid in setup and treatment accuracy. Using proprietary 3D stereo camera units, AlignRT tracks the skin surface, and compares it to the ideal position with submillimetric accuracy. AlignRT can automatically signal for the treatment delivery system to pause radiation if the patient moves out of the desired position, and there is no need for tattoos or additional radiation. Left breast cancer patients: A new study suggests AlignRT helps to reduce radiation heart damage when used with Deep Inspiration Breath Hold (DIBH). Lung and live patients (with Breath-hold SBRT): AlignRT may be used to enable reproducible and accurate delivery. 37 of the 50 "Best Hospitals for Cancer" in the USA have Vision RT technology, and there are more than 700 systems installed around the world. GateCT offers a flexible solution to many of the challenges of 4DCT acquisition, using a single stereo camera unit which tracks the patient during CT acquisition. GateCT can be used to track a patient's breathing during CT scanning and thereby enable 4DCT acquisition and reconstruction. Marker-less: No physical markers, box, belt or bellows needed, nor anything attached to the couch. GateRT facilitates free-breathing gating of the beam through real time optical tracking of respiratory motion. Set gating thresholds, determined during the planning process, and select optimal tracking points on your patient's surface, ensuring efficient and accurate gating. If the patient moves beyond a specified distance out of position or if any abnormal breathing occurs, the radiation beam can be held automatically. Stereotactic calibration module allows clinics to deliver the benefits of frameless, open-mask SRS and SBRT / SABR using SGRT. To deliver the accuracy required for SRS, both an open face mask (supplied by various companies) and the SRS calibration cube (supplied by Vision RT) are required. The Head Adjuster is an option to enable SRS for facilities with no couches with 6 degrees of freedom. The module enables a range of quality assurance tests – TG142 (linear accelerator) and TG147 (non-radiographic imaging). IsoAid is a premier medical device company manufacturing and marketing full-service Brachytherapy products for the treatment of localized cancers. We deliver the highest quality products and services in the most convenient and efficient way to help you give the best possible care to your patients. Manufacturing Advantage™ I-125 and Advantage™ Pd-103 seeds at the activity you want, when you want them. No restrictive list. In addition, we provide in-house loading, sterilization and assay services. Loose Seeds : Sterile or non-sterile available. Mick™: Mick™ loaded seeds available sterile or non-sterile. Pre-loaded : Seeds and spacers are loaded into needles and delivered sterile. Stranded : Seeds are stranded, loaded into needles and delivered sterile. IsoAid is proud to announce our new Secure Strand™. It delivers slow, deliberate strand degradation and is 78% more resistant to movement than standard strands. We offer custom-loaded seeds faster than anyone in the industry. Our needles are clearly numbered and come in high quality needle trays with clearly marked needle numbers and grid locations. Manufacturing High-Activity Advantage™ I-125 seeds for Eye Plaque Brachytherapy. You determine the activity you want up to 9 mCi. No restrictive lists. We deliver loose seeds or custom-loaded plaques, sterilized and ready to implant. You receive a 100% ADCL independent assay on all loaded plaques. At IsoAid, we can either load the plaques you own or the specialized, collimated Eye Physics plaques available for rental through our exclusive partnership with Dr. Melvin Astrahan, PhD, DABR. Over 50 computer-designed, advanced technology gold plaques are available. IsoAid is currently working on some exciting developments for the treatment of Breast Cancer. Stay tuned to see what innovative new treatments we can provide to help you care for women battling Breast Cancer. At Beekley Medical, our goal is to help positively impact patients' lives and improve clinical outcomes. To accomplish this goal, we have a high commitment to investing in the research and development of simple, low cost, disposable products that help medical imaging, surgical, and radiation oncology professionals improve communication, productivity, and patient care. We partner with our customers, clinicians, and inventors to produce professional products that replace makeshift or improve upon current methods. Our industries are carefully monitored to ensure our products meet tomorrow's needs today.